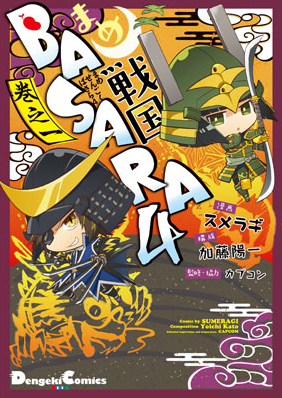 Sumeragi's confusingly-named Mame Sengoku Basara 4 ('Bean Sengoku Basara 4') manga is the spiritual successor to the five-volume Mame Sengoku Basara series, updating the setting to match the latest game and introducing a few new faces to the enormous character roster. This volume from ASCII Media Works collects the first batch of chapters from the series' serialisation in Dengeki Maoh magazine, as well as two side stories originally produced for Sengoku Basara Magazine. It was released on 27th September 2014 for ¥780 before tax and contains ten chapters of the manga spread over 130 pages. Mame Sengoku Basara 4 volume 1 can be purchased from import stores such as Amazon Japan (also on Kindle), CD Japan or Apple's iBooks Store. I'll start my review by briefly summarising each chapter since there still isn't very much information about the book out there. The first story introduces the setting of the game. The drama of the Battle of Sekigahara from the previous series has been replaced by Ashikaga Yoshiteru renouncing his status as shogun and plunging the country into war. As the news spreads across the land, Masamune, Mitsunari and the other warriors raise their armies and head out to fulfil their various ambitions. Since the purpose of this chapter is to allow Sakon to make his debut, the main theme is the Toyotomi army coming to terms with Ieyasu's departure. The second story is about Katsuie, touching on his chequered history in the Oda army and showing his first meeting with Masamune and Kojuurou. In the end, he completely misunderstands Masamune's English slang and believes that he's found a kindred spirit in the 'Dragon King'. The scene of Katsuie rebelling against Nobunaga in the past is hilarious when everyone involved is suddenly tiny and cute. Next, the story delves into Sakon's backstory and his first encounter with Mitsunari. Back in the present he tries to show Mitsunari the thrill of gambling - except his master thoroughly defeats him at every single game they try to play. Sakon's the star of the fourth chapter as well. It's the beginning of a short arc where he's given a special mission to complete. He's so excited about being trusted that he keeps trying to convince himself it's not a dream - dawdling in the process and getting yelled at by the very person he's trying so hard to impress. My favourite part was when Sakon was in such a good mood that he was moving through the compound with flying kicks instead of walking. The same story continues in the next chapter as Sakon approaches Date territory. Katsuie, who is still searching for the 'Follow Me' monster he thinks lives there, ends up being impressed by Kojuurou and studying under him. The two of them eventually form a strange kind of bond. In the conclusion to the arc, Sakon challenges Masamune to a fight but his resolve collapses when he smell the food that Katsuie and Kojuurou have been preparing. All four men help with the cooking then sit down and share a meal, Sakon long having forgotten his reason for being there in the first place. The rest of the chapters feature one-shot stories introducing a few more of the regular characters. The first of these depicts a day in the life of Gotou Matabee as he thinks up various cruel and unusual punishments for anyone and anything in between him and his revenge. Matabee's poor soldiers have a hard time keeping up with his whims. It's Shikanosuke's turn for an introductory chapter next and he's in full detective mode, determined to track down his missing lord no matter what! After completely misinterpreting a hint from Oyassan's deer network, Shikanosuke ends up charging into Takeda territory and accusing Yukimura of being involved in Haruhisa's disappearance. Naotora happens to be visiting at the same time to try to find Takeda Shingen, so naturally sparks end up flying once everyone is assembled. The next chapter is one of the shucchouban ('excursion') stories from Sengoku Basara Magazine. It's a little confusing in context because it's a retelling of Katsuie's first meeting with Masamune, this time from Masamune's perspective and more closely following the story from the game. It might have been better to put this in the second volume rather than have two Katsuie origin stories in the same book. It's followed by the other shucchouban story, this time showing what Motonari has been up to since Yoshiteru started the war. He ends up besting his hated rival more easily than expected thanks to a squabble between Motochika and Magoichi over the terms of their agreement. It took me a while to get around to reading this book but it's another charming collection of short stories and a worthy addition to the collection of any Sengoku Basara fan - unless you really dislike Sakon and Katsuie as they both appear quite a lot in this volume. However, if that doesn't bother you and you liked Sumeragi's previous work on the series, you'll definitely enjoy Mame Sengoku Basara 4 just as much; the cute artwork and mischief make it the perfect companion to the more serious Sengoku Basara 4 manga adaptation which runs in the same monthly magazine. There's also not very much dialogue, making it one of the better books to choose if you're still learning Japanese and want something simple to read. If you know the storylines from the game you'll be able to follow most of the jokes without much trouble. I can't wait to pick up the next volume!